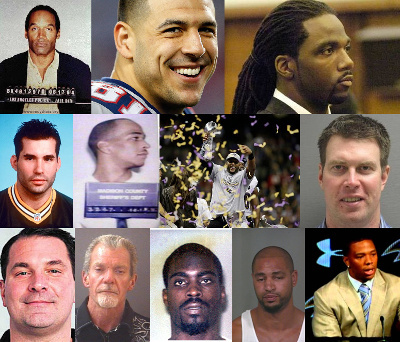 Inspired by the Fulmer Cup on EveryDayShouldBeSaturday, the first Fantasy Crime League was formed during the 2013 NFL off-season. The Fantasy Crime season starts as soon as the Super Bowl ends and lasts until kickoff of the season opener in September. Points accrue to each NFL team based on the severity of the arrests per the scoring table. Majority owners or members of an owner family (with a stake), front office employees, coaches, and players on the current roster are all eligible for inclusion in the league. Convictions and plea bargains are not taken into account. The fantasy points come strictly from the initial charges stemming from verified arrests. All arrested or charged parties are presumed innocent until proven guilty in a court of law. The Fantasy Crime League does not take any position on the guilt, innocence or general morality of said parties and/or their alleged crimes. All information found on this site is public information acquired from major news outlets.